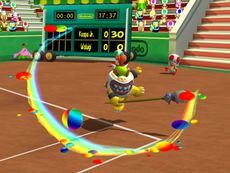 Magic Paint is an Offensive Power Shot used by Bowser Jr. in Mario Power Tennis. Once activated, Bowser Jr. uses the Magic Paintbrush, which was first seen in Super Mario Sunshine, and moves towards the ball, then precedes to paint it. Once hit, Bowser Jr. will send three paint balls to the opposing side. The center paint ball will always be the real tennis ball, the other two paint balls are merely decoys to try and fool the receiver. If the real tennis ball is returned, the receiver will be slowed down due to the paint. This page was last edited on April 29, 2017, at 18:42.